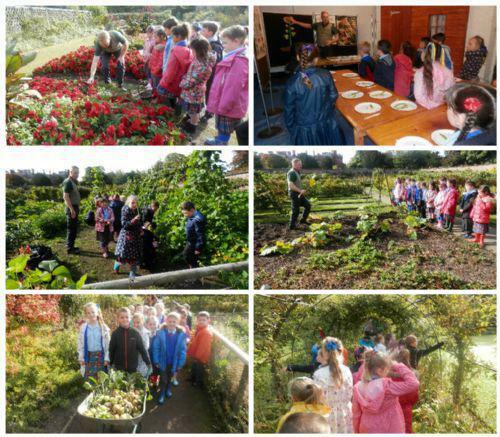 A few weeks ago, as part our Science work, we had the opportunity to go to the amazing Croxteth Hall Park! We wanted to continue learning about different types of plants and different methods of seed dispersal. This was our first trip as part of the Junior school so we were really, really excited! When we arrived, we were given instructions by the hilarious Mr. Marrow. He wanted us to help him harvest his field, so that he could sell all of the produce in his shop. This was really enjoyable and Mr. Grub (or Grump as Mr. Marrow called him!) gave us plenty of information about the different types of shrubs, plants and food that we were collecting! We had a shopping list which told us to find flowers, potatoes and even odd flowers that smelt strange! Once we had discovered and collected all of the items on our shopping list, we took them to Mr. Marrow who was so pleased with all of our hard work! He even gave us some of his produce to take with us (including rhubarb and even a marrow!). It wasn’t all hard, grubby work though! We also continued to develop our knowledge of plants. Mr. Grub gave us a presentation about the different parts of a plant, such as the petal, the seeds, the root, the stem and the flowers. We even got to find our own seeds by cutting a few of the flowers! We EVEN talked about photosynthesis and germination! My favourite part of the trip was when Mr. Grub told us about all of the different ways that seeds can be dispersed – including through wind, animals and water (the best one was the Himalayan Balsam, which exploded and dispersed its seeds whenever it was touched). This trip was really fun and I can’t wait to go on another.